Temple of Zeus Olympios. It was tripteral octastyle on the two narrow sides, and dipteral eikosastyle on the long sides, that is, it was surrounded by 104 Corinthian columns in total. Inside the building, along the north and south walls, there was an additional Ionic colonnade. The temple was built between A.D. 124 and 132. 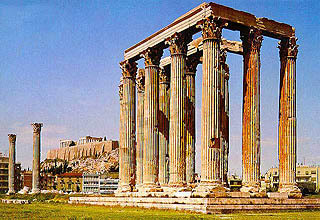 Temple of Apollo Delphinios. Peripteral Doric temple, dated to 500 B.C. The Court at the Delphinion. Ancient building with a spacious courtyard and rooms along the north side. Dated to ca. 500 B.C. Gates of the city wall of Athens, built by Themistocles in 479/78 B.C. Roman baths, constructed in A.D. 124-132. Temple of Panhellenic Zeus, built in A.D. 131-132. Temple of Cronos and Rhea. Small, dipteral temple dated to A.D. 150. Hadrian's arch, dated to A.D. 131.